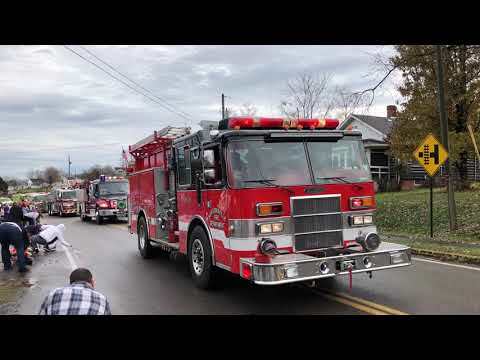 CHURCH HILL — Church Hill’s annual Christmas parade went on as scheduled Saturday morning despite the rainy weather. It was a cloudy morning with sprinkles, although the rain took a break for the parade that started at 11 a.m. and went through Main Boulevard downtown. As usual, candy thrown from floats, fire trucks, ambulances and rescue squad vehicles abounded in the parade, which started in the parking lot of the Senior Center and exercise center, turned left onto Main Street and continued through downtown until almost U.S. Highway 11W or the “four-lane.” The Shriners, various churches and local politicians were in the parade, as was a Food Lion truck pulling an antique Food Lion truck and Food City employees pushing grocery carts from which they gave out goodies. 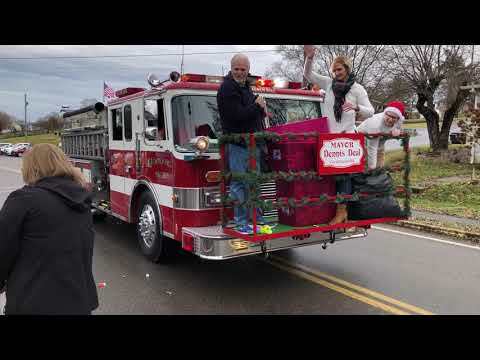 The annual event also included Santa and Mrs. Claus near the end of the parade, with Santa throwing out candy, followed by some horse riders, one in a medieval clothing, and others riding in a horse-drawn wagon.